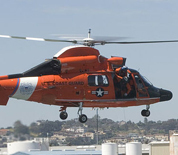 US Coast Guard Air Station Los Angeles is located at Los Angeles International Airport in Playa del Rey, California. The air station conducts search and rescue, homeland security and environmental protection missions along California's coast from Dana Point to Morro Bay. USCGAS Los Angeles is specifically responsible for monitoring the waters near Los Angeles International Airport, the Port of Los Angeles, the Port of Long Beach and Channel Islands National Park. Due to the station's close proximity to Hollywood, it's aircraft have been featured in several television series. The premier aircraft flown at USCGAS Los Angeles is the HH-65 Dolphin helicopter. This USCGAS Los Angeles directory features the critical info you’ll need to navigate through the many facilities and recreational opportunities available on base.